ARLINGTON, VA – (August 19, 2015) – Hobsons, the world’s leader in connecting learning and life, today announced Naviance Test Prep, a new online learning platform that makes test prep engaging and personalized for students. The new solution uses game-based mechanics to deliver content from leading publishers, including McGraw Hill, Allen Prep, Cengage Learning, and MasteryPrep. Naviance Test Prep is seamlessly integrated with the Naviance platform, which enables students to access all of their college and career planning resources in one place, and helps school counselors and administrators report on the progress of their institutions’ college readiness efforts while delivering individualized guidance and instruction to each student. The new courses are personalized to help students maximize study time by focusing on content most important to them. The game-based solution rewards students with achievements and badges as they answer questions correctly. The latest research on gamification and learning proves that students are more likely to learn critical concepts when materials contain incentives and game mechanics. 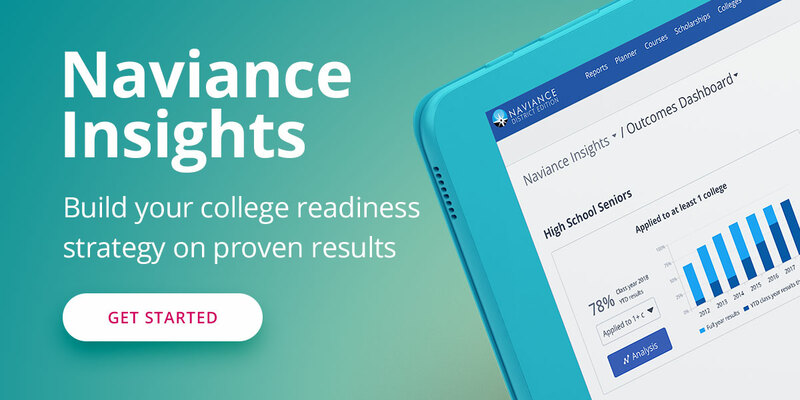 In addition to helping students prepare for the ACT and SAT, Naviance Test Prep now offers content for 18 Advanced Placement® courses, furthering students’ ability to pursue their college and career readiness goals. The new solution also is aligned to Common Core and ACT standards, and content is continually refreshed by subject-matter experts from various publishers. Available today, Naviance Test Prep will support students preparing for the redesigned version of the SAT exam, which is being administered for the first time in March 2016. For more information on Naviance Test Prep, visit the website here. SAT and AP are registered trademarks of the Collegeboard. ACT is a registered trademark of ACT, Inc. Neither of the trademark holders are affiliated with Hobsons. Hobsons is the international leader in connecting learning to life. Through our student success solutions, we help more than 12 million students around the globe identify their strengths, explore careers, create academic plans, match to best-fit educational opportunities, and finish what they start. We partner with schools, colleges, and universities to improve college and career readiness, admissions and enrollment, and student support and advising. For more information, visit www.hobsons.com.